Winslow's Christmas Tree Farm sits at the base of Mount Willow in the town of Foxcroft. The annual winter crafts festival at Winslow's offers handmade bayberry candles, rustic wreaths, orange pomanders and much more. Meandering down the lane leading into Winslow's, you pass rows upon rows of fragrant Christmas trees ready for harvest. Winslow's is the scent of winter. Fir, woods, bayberry and mistletoe meld with spicy clove and blood orange essential oil and the result smells effectively like bottled winter. Winslow's contains fir absolute and essential oil, spruce EO, cedar, a touch of guaiacwood and a blend of several fragrance oils in addition to the bayberry, mistletoe, clove and blood orange. Fans of our Black Christmas soap will love Winslow's as the fragrance is very similar. If you enjoy evergreen and/or woods scents or our Shoikan Grove, Covered Bridge and the previously offered Cedar & Siberian Fir fragrance, make sure to try Winslow's. The combination of bayberry and clove gives the impression of a Victorian Christmas. Unisex. I have been returning to this fragrance many times since purchasing it a week and a half ago. I almost cannot stop myself doing it even though it is summer where I live, it still brings back many happy memories. It is certainly evocative of winter with it's fir and clove notes, but to me not so much of an outdoors winter, but rather the indoor scent of a home with a real christmas tree and decorative wreaths decorating the room. Like many Solstice fragrances, Winslow's is soft and warm in it's overall effect despite the use of fir absolute. The subtleness of the overall effect was a surprise as I had expected a blast of fir, but it has been kept well in hand and balanced with the other notes ensuring that it is a definite fragrance and not a room spray type scent. An appropriate and evocative offering for this time of year for men and women it is really incredibly approachable and beautiful. I am so glad Angela has given us this wonderful Christmas gift. I am just adding an edit to my last post. Last evening I did a test of Winslow's with a very heavy application. The fir was much stronger as an introductory top note, but there was also a wonderful resin drydown that lasted several hours. At this strength I found the fragrance to be much more masculine and it had a good sillage. The fir, clove and resin gave a somewhat mysterous and solemn tone to the fragrance which did not occur at lower application strengths where the warmth dominated. With the clove providing a medicinal warmth, the resins adding a woody strength and the fir adding the balancing green to the browns of the woods. The blood orange seems to be used as a supporting note to add to the sharpness of the fir and resins and was not immediately obvious to my nose. A magical fragrance indeed. This scent is classic Christmas, full of memory. It's the scent of all your vintage Christmas decorations packed away each year, infused with the bayberry candles you burned and the oranges and cloves you simmered on the stovetop. It's the snow and stray pine needles that you carried inside with you after traipsing in the woods searching for the perfect tree. I got a wonderful scent memory from this, of all these things, coupled with the anticipation that a child feels and the comfort of the traditions repeating each year. I really wish this would be released next year as a home fragrance oil, it would be wonderful! This is my absolute favorite perfume to wear during the winter! blend beautifully together & I can definitely smell a hint of orange. 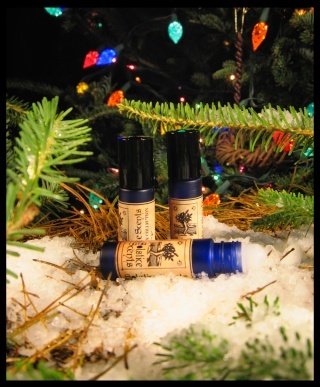 if you love the smell of cloves or Christmas trees! Winslow's smells exactly like a fresh cut Christmas tree and a clove studded orange pomander. Very authentic and true. The first hour is very much fresh pine and orange pomanders. After the first hour, the scent goes rather smoky on me, turning to smoky clove with a hint of sour pine and dry, dusty orange pomander. I think that I would like this more as a room scent.